States have important roles to play in ensuring that productivity gains lead to broadly shared prosperity. This means ensuring that the incomes of low-wage and middle-class workers rise with productivity. States can do this through tax policy, through higher minimum and living wages, and through policies that strengthen labor standards and the bargaining power of workers. The tax policies heavily promoted by the rankings won’t create a path to prosperity. All four of the rankings reviewed on this site favor more regressive forms of taxation—those that require lower income households to pay a higher share of their income than those at the top – but in reality just the opposite approach is better for the economy. An increase in taxes on upper-income households to finance an increase in programs that help people to make ends meet, such as food stamps or child care assistance, would have a net positive effect on the economy. The resulting increase in consumer spending induced by such payments is much higher than the reduction in spending caused by taxing high incomes. Increases in food stamps or unemployment compensation in fact stimulate the economy five times more than cuts in taxes on high-income households.1 Progressivity is good for the economy. State tax systems can be reformed so that they don’t increase the gap between the very wealthy and everyone else. Most state tax systems actually reinforce the income inequality generated by the market because those at the very top pay a smaller percentage of their income in taxes than those in the middle or at the bottom. A state tax system could mitigate market inequalities by moving away from regressive sales taxes towards greater reliance on a progressive income tax, by the enactment or expansion of a state Earned Income Tax Credit, by expanding personal exemptions or child and dependent care credits, or any number of similar measures. Nearly all states (45) have minimum wage laws that establish a state minimum wage for groups of workers not covered by the federal minimum and/or establish a state minimum for federally-covered workers that is higher than the federal rate. As of October 2015, 29 states had a minimum wage higher than the federal. Raising the minimum wage is clearly a powerful tool for states and localities to boost the incomes of working families and individuals. The ALEC-Laffer State Economic Outlook Ranking penalizes states for having a state minimum wage higher than the federal, but provides no rationale whatsoever for the claim that higher minimum wages reduce prosperity. Research conducted in the 1990s and more recently has demonstrated that a modest increase in the minimum wage clearly raises incomes overall and has a very small or nonexistent impact on employment.2 Part of the reason for this finding is that higher minimum wages boost the incomes of millions of workers, who in turn spend more in the local economy. Second, minimum-wage jobs are overwhelmingly in local market sectors such as leisure and hospitality (especially food service) and retail trade.3 By that we mean these jobs are tied to the local market and are not in mobile industries in which a company can seek out the best production location among many states and then export to national or world markets. Broadly shared prosperity is not a new idea, nor is it a mystery how to attain it. From the 1940s through the 1960s, the American economy experienced significant growth and that growth led to income gains across the working population, especially among those who had been paid the least. It is hardly a coincidence that this was also a period when new labor standards and protections for workers were put in place, and a substantial share of the workforce was represented by a labor union. Good labor standards and effective labor unions ensured that the gains from rising productivity were shared with workers. As the share of the workforce represented by a union declined, beginning in the 1970s, the connection between rising labor productivity and rising wages was severed, and income inequality rose inexorably, and continues to rise today. 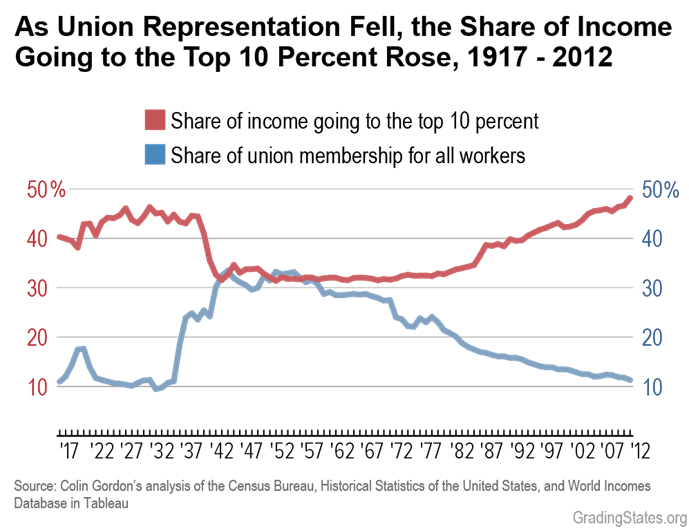 The connection between labor representation and income inequality can be seen in the graph below, and in similar graphs that tell the same story, state-by-state.4 As union representation falls in a state, income inequality rises. States have a major role to play in moving the country back to the model of shared productivity gains that produced a large and prosperous middle class in the immediate post-war era. This includes vigorous enforcement of state and federal labor standards, including minimum wage laws, overtime rules, and cracking down on abuse of independent contracting to avoid employment responsibilities. It includes new legislation and enforcement aimed at eliminating rampant wage theft — when employers violate wages and hours laws and fail to pay wages due workers. Importantly, measures strengthening the bargaining power of workers benefit non-union workers as well, because other employers have to respond to competition in the job market and match the wages and benefits of union workers. Some of the business climate indexes, however, are aimed at pushing states in the opposite direction, such as by adopting policies that make it easier for corporations to resist efforts of their workers to band together to form unions, for example with what are inaccurately called “right-to-work” laws. Right-to-work laws do not create a right to a job. They are laws that take away the right of labor unions to negotiate a contract provision requiring all workers who are covered by and benefit from a union contract and union services (which must be provided to all workers) to support the cost of negotiating and maintaining that contract. The clear intent and effect of such laws is to weaken unions, thereby reducing their ability to win higher wages and better benefits. These effects would be larger if we considered only those private industries with the highest unionization rates. It is important to note also that these are the effects for all workers in the state, union and non-union, and that the right-to-work penalty is even deeper for women, blacks, and Hispanics. 5. Elise Gould and Heidi Shierholz, “The Compensation Penalty of ‘Right-to-Work’ Laws,” Briefing Paper, the Economic Policy Institute, Washington, D.C., February 17, 2011. 7. Dale Belman, Richard Block and Karen Roberts, “Economic Impact of State Differences in Labor Standards in the United States, 1998-2000,” East Lansing, Michigan, Michigan State University, Jan. 21, 2011, posted on the Employment Policy Research Network blog. 8. Lonnie Stevans, “The Effect of Endogenous Right-to-Work Laws on Business and Economic Conditions in the United States: A Multivariate Approach,” Review of Law and Economics, vol. 5, no. 1, 2009, pp. 595-612.